To build a future powered by renewable energy, we need to inspire the next generation of advanced energy leaders. By training teachers to integrate solar energy lessons into their classrooms, SunPower is helping educators make their science, technology, engineering and math curricula more applicable and relevant. For the past five summers, as part of our broader SunPower HorizonsTM Solar Education programs, we offer a free four-day externship for high school and college teachers that provides them with real world technical expertise, so when students go back to school each year, they have a chance to learn relevant solar energy skills. The teachers, who range in discipline from computer science to building trades, are also trained to help students explore solar energy industry careers. “How can we make learning relevant? That’s what this is all about,” said Bobby Ram, SunPower Specialty Product Regional Sales Manager, during the June training session at SunPower’s Richmond, Calif., office. 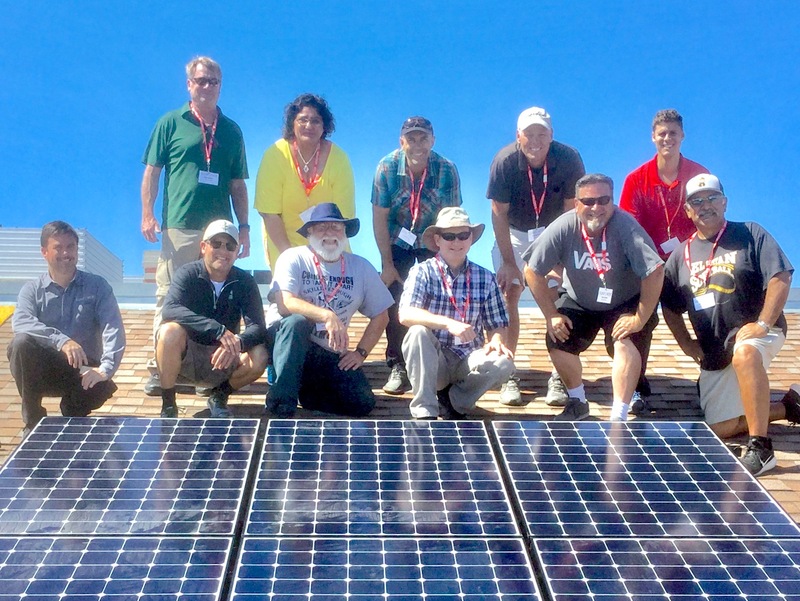 Teachers are trained in the same way that SunPower trains its technicians and solar dealers to understand residential solar design and solar panel installation. “The opportunity to be treated like an industry professional is very rare,” said teacher Andrew Tait, of the Washington Unified School District. Timothy Coats, a senior technical trainer at SunPower, gave the teachers a first-hand look at how a home solar system works. Teachers then designed a rooftop solar system for a perspective client; an exercise that many of them plan to do with their students. The Solar Externship is only one part of SunPower’s overarching commitment to the future of STEM education. Several teachers who completed the training course are also instructors for SunPower’s Summer Solar Energy Academy, a five-day internship that prepares high school students for jobs in the renewable energy industry. He hopes introducing solar energy to them will show that the future is wide open when it comes to potential careers. And, because roofing is already part of his course, implementing a solar design and installation section makes perfect sense. “We’re at a point where we have to be teaching our students about solar,” he said. Solar energy helps make STEM education tangible. Integrating solar technology lessons provides opportunities for project-based learning that gets students prepared and excited for college and career paths. San Rafael High School physics teacher Steve Temple views solar energy education as a way to future-proof his classroom and his students. For Temple, getting professional exposure at SunPower during the Teacher Externship will make a huge difference for his students. On the third day of the externship, the teachers installed a solar system on an outdoor rooftop to bring the indoor technical training to life. Temple was impressed by how rigorous the training program was. "I'm really pleased that the training is a little more technical than I thought it was going to be. I was a little worried. The professional world doesn't always respect the teaching profession, and it's clear that's not the case with SunPower,” he said. Temple explains that solar energy is one part of a greater movement to create relevant and future-oriented STEM curricula. Project-based learning is at the heart of SunPower's education initiatives. Work-based programs, such as the Solar Energy Academy, give students realistic exposure to post-high school life and motivate them to consider pursuing STEM careers. Adapting STEM classrooms to meet the needs of the future is not only good for students, it's also good for the planet. Changing the way our world is powered means changing the way we approach STEM education. Find out how to help your school district to go solar to save money and help the environment.